هدف از پژوهش حاضر بررسی تأثیر یادگیری مشارکتی بر اضطراب و انگیزه پیشرفت تحصیلی بود. طرح پژوهش، آزمایشی از نوع پیش‌آزمون و پس‌آزمون با گروه گواه بود. از منطقه 5 آموزش‌وپرورش با روش نمونه‌گیری خوشه‏ای، دو کلاس ششم دخترانه از دو مدرسه متفاوت به‌عنوان گروه آزمایش (40= N) و گواه (40= N) انتخاب شدند. در مرحله پیش‏آزمون، هر دو گروه به مقیاس اضطراب کودکان اسپنس (1994) و پرسشنامه انگیزه پیشرفت تحصیلی هرمنس (1970) پاسخ دادند. سپس در گروه آزمایش، تمامی دروس به مدت دو ماه با روش یادگیری مشارکتی ارائه شدند. درحالی‌که به گروه گواه با شیوه متداول آموزش داده شد. پس از دو ماه، هر دو گروه به مقیاس اضطراب کودکان اسپنس (1994) و پرسشنامه انگیزه پیشرفت تحصیلی هرمنس (1970) پاسخ دادند. با استفاده از تحلیل کوواریانس نتایج نشان داد که یادگیری مشارکتی، اضطراب دانش‌آموزان را کاهش و انگیزش پیشرفت تحصیلی را افزایش می‏دهد (001/0p <). لزوم آموزش معلمان جهت به‏کارگیری شیوه یادگیری مشارکتی در کلاس درس به‌منظور کاهش اضطراب و افزایش انگیزش پیشرفت موردبحث قرار گرفت. بیات، مرضیه؛ هاشمی، زهرا و نقش، زهرا. (1394). مدل علی پیش‌بینی عملکرد درس زبان انگلیسی: نقش ارزش تکلیف، خودکارآمدی زبان انگلیسی، ادراک از ساختار هدفی کلاس، اضطراب زبان خارجی و راهبردهای شناختی. فصلنامه پژوهش در نظام‌های آموزشی، 9(31)، 255 – 285. سلیمانی، محبوبه. (1390). بررسی عملی بودن اعتبار و روایی و نرم یابی پرسشنامه اضطراب اسپنس. پایان‌نامه کارشناسی ارشد. دانشکده روان‌شناسی و علوم اجتماعی دانشگاه آزاد اسلامی واحد تهران مرکز. شیرازی، محمود. (1394). تعیین میزان شیوع اضطراب امتحان و ارتباط آن با عملکرد تحصیلی در دانش‌آموزان دبیرستانی استان سیستان و بلوچستان. فصلنامه پژوهش در نظام‌های آموزشی، 9(31)، 167-186. 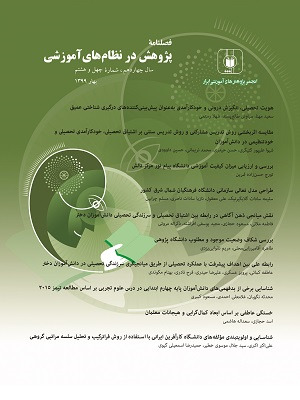 نامدار، کیوان. (1382). بررسی و مقایسه عزت‌نفس و انگیزه پیشرفت تحصیلی و رابطه آن با عملکرد تحصیلی دانش‌آموزان مبتلا به آسیب بینایی و شنوایی طرح تلفیقی و عادی استان همدان. پایان‌نامه تحصیلی کارشناسی ارشد کودکان استثنایی. دانشگاه همدان. ولایتی، الهه؛ نیلی احمدآبادی، محمدرضا؛ زارعی زوارکی، اسماعیل؛ شریفی درآمدی، پرویز و سعدی پور، اسماعیل. (1395). تأثیر چندرسانه‌ای آموزشی طراحی‌شده بر اساس نظریه‌ بار شناختی بر یادگیری، یادداری و انگیزش پیشرفت تحصیلی دانش‌آموزان کم‌توان ذهنی در درس علوم. فصلنامه پژوهش در نظام‌های آموزشی، 10(34)، 59-84. Ariza, E. N. (2010). Resurrecting “Old” Language Learning Methods to Reduce Anxiety for New Language Learners: Community Language Learning to the Rescue. Bilingual Research Journal, 26, 3, 717-728. Aronen, E. T., Vuontella, V., Steenari, M. R., Salmi, J., & Carlson, S. (2004). Working memory, psychiatric symptoms, and academic performance at school. Neurobiology of Learning and Memory, 83(1) 33-42. Balogun, A. G., Balogun, Sh. K., & Onyencho, Ch. V. (2017). Test Anxiety and Academic Performance among Undergraduates: The Moderating Role of Achievement Motivation. Spanish Journal of Psychology, 20, E 14. Bilesanmi-Awoderu, J. B., & Oludipe, D. I. (2012). Effectiveness of cooperative learning strategies on Nigerian junior secondary students’ academic achievement in basic science. British Journal of Education, Society & Behavioural Science, 2(3), 307-325. Boekaerts, M., De Koning, E., & Vedder, P. (2006). Goal directed behavior and contextual factors in the classroom: An innovative approach to the study of multiple goals. Educational Psychologist, 41(1), 33–54. Chandra Kala, P., & Shirlin, P. (2017).A study on achievement motivation and socio economic status of college students in tirunelveli district. International Journal of Research - Granthaalayah, 5(3), 57-64. Eret, E., Gokmenoglu, T., & Engin-Demir, C. (2013). A review of research on educational theories and approaches affecting student’s achievement: 1990-2011. Elementary Education Online, 12(3), 687–700. Fischer, S., & Shachar, H. (2004). Cooperative learning and the achievement of motivation and Perception of Student in the grade Chemistry Classes. Learning and Instruction, 14, 69 – 87. Garshasbi, A. (2016). The impact of a cooperative learning model on students’ self-motivation and academic performance in high school. Malaysian Online Journal of Educational Management, 4, 3, 37 – 51. Ghorbani Nejad, SH., & Keshavarzi, A. (2015). The effect of cooperative learning on reading comprehension and reading anxiety of pre-university students. Journal of Applied Linguistics and Language Research, 2, 8, 169-180. Gillies, R. M., Ashman, A., & Terwel, J. (2008). The teacher’s role in implementing cooperative learning in the classroom, Springer Science. Business Media, LLC. Hermans, H. J. (1970). A questionnaire measure of achievement motivation. Journal of Applied Psychology, 54(4), 353-363. Johnson, D. W., Johnson, R. T., & Holubec, E. (1999). The New Circles of Learning: Cooperation in the Classroom and School. USA: Educational leadership, association for supervision & curriculum development. Kaya, M. F. (2015). A qualitative research on determination of social studies teachers’ perceptions of success. Turkish Studies, 10, 563–584. Laal, M., & Ghodsi, S. M. (2012). Benefits of collaborative learning. Procedia - Social and Behavioral Sciences, 31, 486 – 490. Malanchini, M. (2017). Non-cognitive factors of educational achievement: motivation and anxiety. PhD. dissertation, Goldsmiths, University of London. McClelland, D. C. (1965). Achievement and entrepreneurship: A longitudinal study. Journal of personality and social psychology, 1, 389-392. Marashi, H., & Khatami, H. (2017).Using cooperative learning to boost creativity and motivation in language learning.Journal of Language and Translation, 7, 1(13), 43-58. Meetei, R. (2012). A ciritical study of impact of academic anxiety on academic achievement of class ixth students. Retrieved 20 January 2018 from http://www.scribd.com/doc/23767970/A-Ciritical-Study-of-Impact-of-Academic-Anxiety-on-Academic-Achievement-of-Class-Ixth-Students-Bareilly. Mehdizadeh, S., Nojabaee, S. S., & Asgari, M. H. (2013). The effect of cooperative learning on math anxiety, help seeking behavior. Journal of Basic and Applied Scientific Research, 3(3)1185-1190. Mehar, R., & Singh, N. (2017). Effect of cooperative learning strategy on science anxiety in relation to emotional intelligence. Asian Journal of Research in Social Sciences and Humanities, 7, 8, 387-400. Miller, Y. c. (2008). Battle buddies: A cooperative learning technique for reducing anxiety and increasing motivation. Research paper. Center for Teaching Excellence, United States Military Academy. Nadeem, M., Ali, A., Maqbool, S., & Zaidi, S. U. (2012). Impact of Anxiety on the Academic Achievement of Students Having Different Mental Abilities at University level in Bahawalpur (Southern Punjab) Pakistan. International Online Journal of Educational Sciences, 4 (3), 519-528. Oludipe, D., & Awokoy, J. O. (2010). Effect of Cooperative Learning Teaching Strategy on the Reduction of Students Anxiety for Learning Chemistry. Journal of Turkish Science Education, 7(1), 30-36. Pattanapichet, F., & Changpueng, P. (2012). Cooperative Learning: An Approach To Reduce Students’ Anxiety In Learning English. Executive Journal, 32(4), 61 – 66. Quinn, P. (2006). Cooperative Learning and Student Motivation. M. A. Thesis, State University of New York, Department of Education and Human Development. Sadock, B. J., & ‎ Sadock , V. A. (2010). Kaplan and Sadock's Pocket Handbook of Clinical Psychiatry, 5th Edition. New York: Lippincott Williams & Wilkins. Slavin, R. E. (1991). Group Rewards Make Group Work. Educational Leadership, 48(5), 89-91. Suwantarathip, O., & Wichadee, S. (2010). The impacts of cooperative learning on anxiety and proficiency in an efl class. Journal of College Teaching & Learning, 7(11), 51 – 58. Spence, S. H. (1994). The strueture and assessment qlanxiety h7 chtTdren. Paper presented at the Association for the Advancement of Behavior Therapy, San Diego, CA. Spence, S. H., Barrett, P. M., & Turner, C. M. (2003). Psychometric properties of the Spence Children's Anxiety Scale with young adolescents. Journal of Anxiety Disorders, 17(6), 605-625. Syokwaa, K. A., Aloka, P. J. O., & Ndunge, N. F. (2014). The Relationship between Anxiety Levels and Academic Achievement among Students in Selected Secondary Schools in Lang’ata District, Kenya.Journal of Educational and Social Research, 4, 3, 403 – 413. Tatar, E. (2011). The Relationship between Mathematics Anxiety and Learning Styles of High School Students. New Educational Review, 28(2), 94 – 101. Tsay, M., & Bradrady, M. (2010). A case study of cooperative learning and communication pedagogy: Does working in teams make a difference? Journal of the Scholarship of Teaching and Learning, 10, 2, 78 – 89. Van Nuland, H. J. C., Dusseldorp, E., Martens, R. L., & Boekaerts, M. (2010). Exploring the motivation jungle: predicting performance on a novel task by investigating constructs from different motivation perspectives in tandem. International Journal of Psychology, 45, 250-259. Vitasari, P., Abdul Wahab, M. N., Othman, A., Herawan, T., & Sinnadurai, S. K. (2010). The Relationship between Study Anxiety and Academic Performance among Engineering Students. International Conference on Mathematics Education Research. Procedia Social and Behavioral Sciences, 8, 490–497. Wang, M. (2012). Effects of Cooperative Learning on Achievement Motivation of Female University Students. Asian Social Science, 8(15), 108 – 114. Young, D. J. (1999). Affect in Foreign Language and Second Language Learning: A Practical Guide to Creating a Low-anxiety Classroom Atmosphere. Boston: McGraw-Hill College. Yoshida, H., Tani, S., Uchida, T., Masui, J., & Nakayama, A. (2014). Effects of online cooperative learning on motivation in learning Korean as a foreign language. International Journal of Information and Education Technology, 4, 6, 473- 477. Zakaria, E., Solfitri, T., Daud, Y., & Abidin, Z. (2013). Effect of cooperative learning on secondary school students’ mathematics achievement. Creative Education, 4, 98-100.